Humor Me This - Who Cleans the Plate After a Tantrum? On a lighter note, Yankees Manager Joe Girardi finally cleaned home plate after covering its Floridian cousin with dirt during a post-ejection tantrum on Saturday. Veteran Crew Chief Jerry Layne called Girardi out of his dugout during Monday night's pre-game plate meeting at Yankee Stadium, and had the Yankees skipper symbolically remove the dirt he had placed in Tampa Bay two days prior. 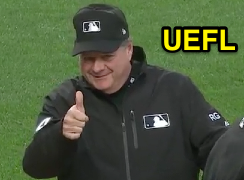 On May 20, HP Umpire Scott Barry ejected Girardi and Yankees Pitching Coach Larry Rothschild for arguing balls and strikes during the 6th inning of an eventual New York loss to the Rays. While arguing with Barry, Girardi elected to cover home plate with dirt before storming back to the visiting clubhouse at Tropicana Field. When asked about it after the game, Girardi explained, "Jerry Layne and I go back a long way—him behind me when I was a catcher and always laughing. As the two wonderful little kids took out the lineup card, Jerry called me out and said that I set a bad example for kids and I should clean the plate. I thought it was quite humorous."